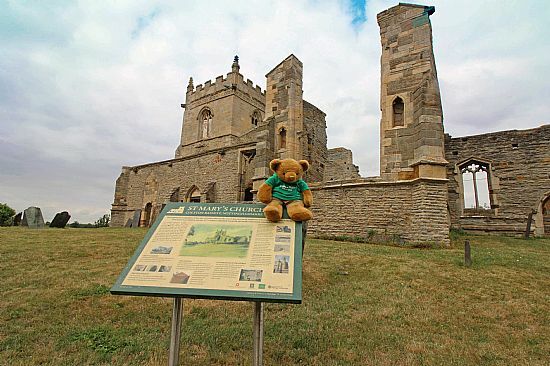 Considering I live in Nottinghamshire I've not visited many St Mary's churches in the county. I'll have to see if I can do better! 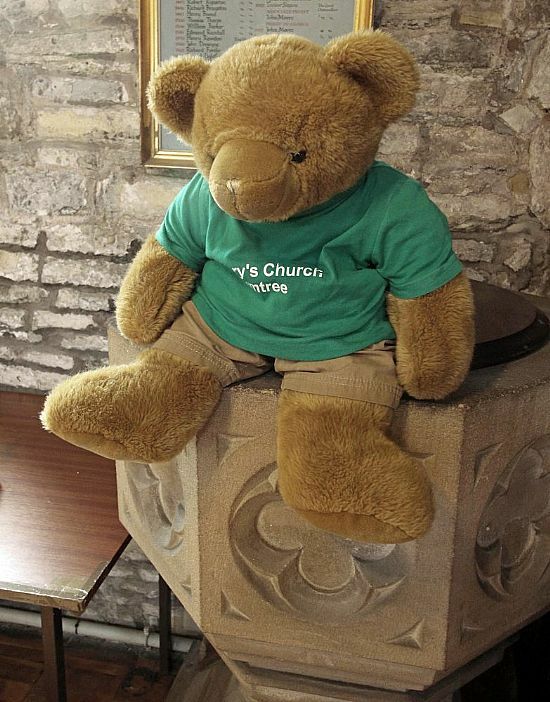 Click on a picture to read a bit more about the church (and maybe see more pictures of me!). I think I should point out that I'm not standing on a bush in my main photo; Oh no, I'm swinging from the sign! 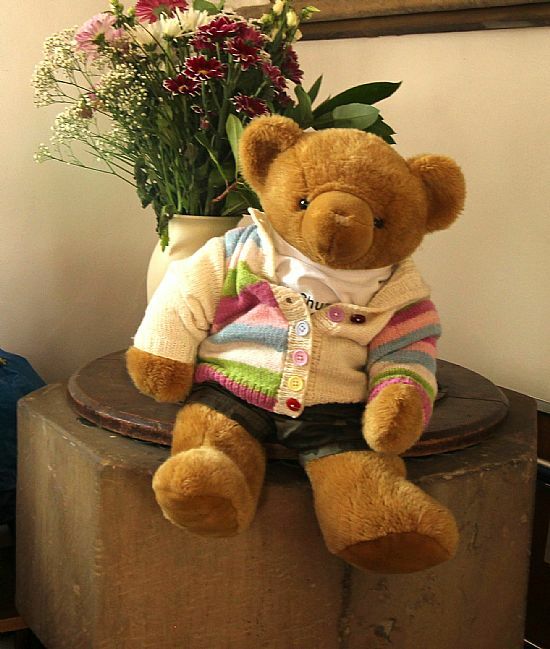 After all I am a very intrepid bear. The church was open so I had a good look around. There's a very comfy font at the back. St Mary's Barnstone closed last year. It doesn't have a notice board, just a rickety gate and it's looking a bit sad and overgrown already. This is the closest St Mary's to my home in Plumtree so I decided to visit it. 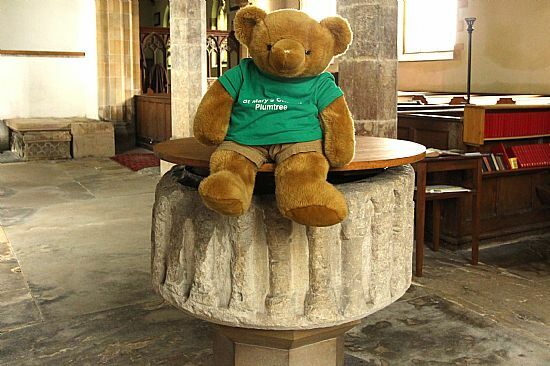 I met some really nice people and the churchwarden told me all about the building. This is a really, really big church for a small village. And it has two fonts. I sat on both of them for my photo. The older font is in front of a memorial to "the Wrestling Baronet" (Sir Thomas Parkyns); in the bigger photo he looks like he's trying to grab me! 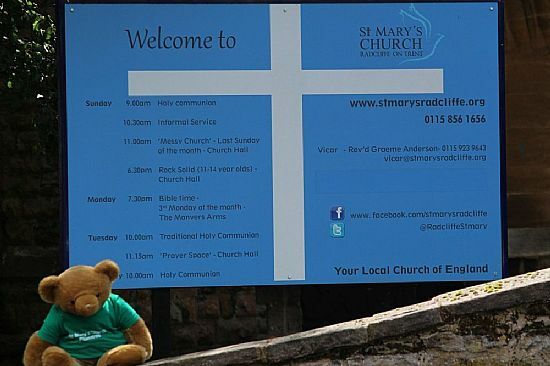 This St Mary's has got two notice boards next to each other which is a bit odd. I got sort of wedged between them and nearly sat on a fence spike (that wouldn't be good for my smart new trousis - and wouldn't be good for my bottom either!). I would like to point out that I was not responible for making this church fall down - it was like this when I arrived [snigger]. This is my first ruined church - and it's quite interesting. 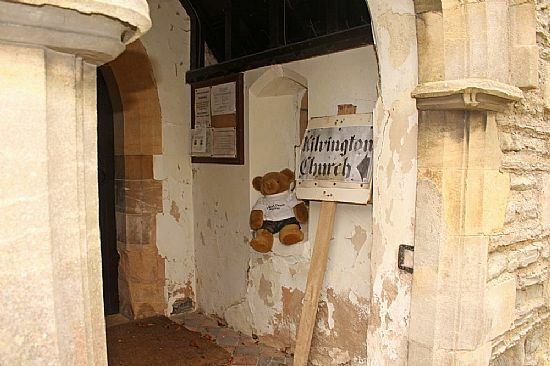 There are information boards around the place telling you all about the church and its history. 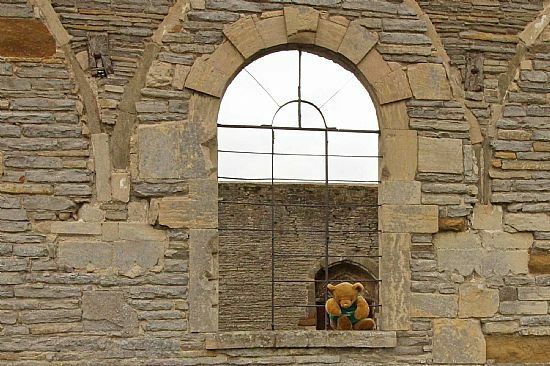 I sat on one for my main photo, and then I looked through the remains of this window for another photo. 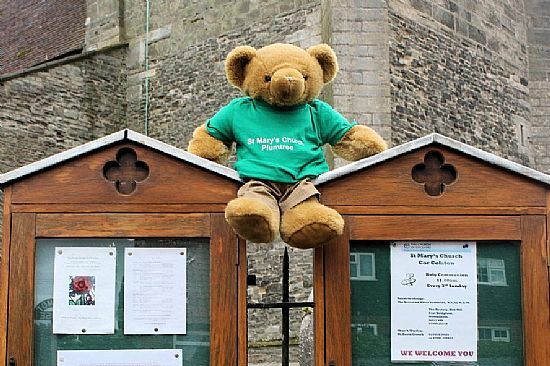 There is another church in Colston Bassett that they built before they pulled this one down, but it's not a St Mary's. 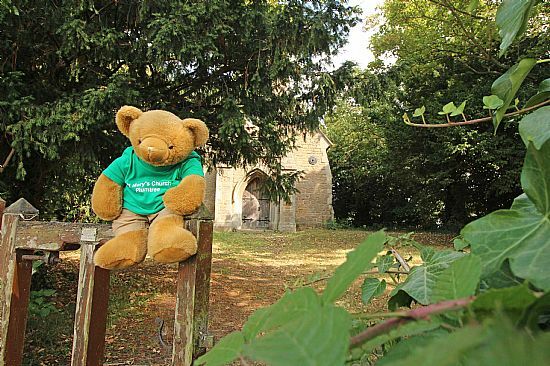 Despite it being a ruin, the church has not been deconsecrated and people are still buried in the churchyard. I sat on the wall to have my photo taken outside. I had to sit on a carrier bag because the wall was very damp and I didn't want to get a damp bottom. The only old bit of this church is the tower; the rest was burned down and rebuit 50 years ago. 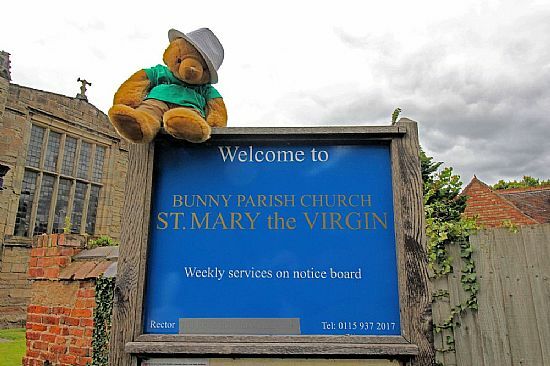 This is a very friendly St Mary's. I visited on a Friday morning and their cafe was open and they had excellent cake (my splendid fur got unaccountably sticky)! 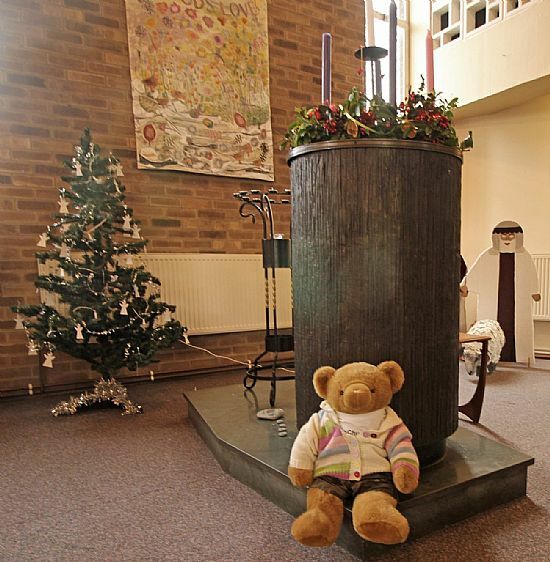 A very nice lady then showed me around the church which was all decorated for Christmas. They have a very different font - I quite like it (see my photo on the left). 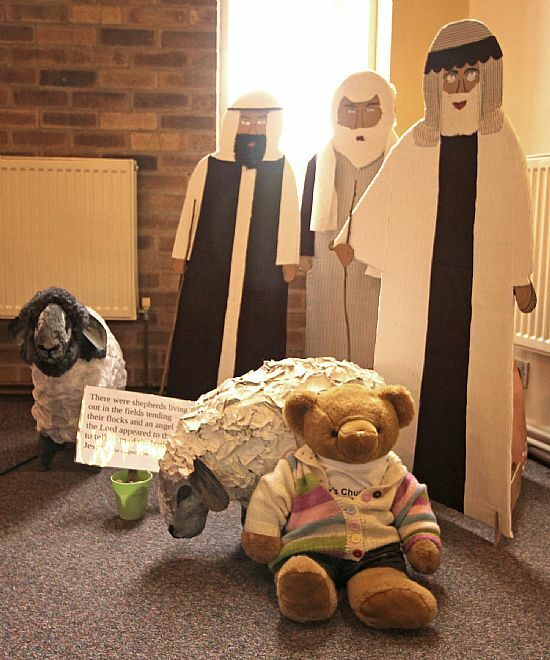 All around the church there were cut-outs of people telling the Christmas story and I sat next to a sheep. I'm not sure this St Mary's was meant to be open, but there was a lady doing flowers in the Vestry, so I sneaked in for a peek. I had to sit a bit squint on the font 'cos there were flowers on it and I didn't want to cause trouble by knocking them over. It took two goes to find this St Mary's; it's very well hidden. The church is up a little road and then you have to go through a gate into a field and say "Hello" to a horse, then turn left and go through another gate and across a little bridge. Needless to say it didn't have a sign and wasn't open! 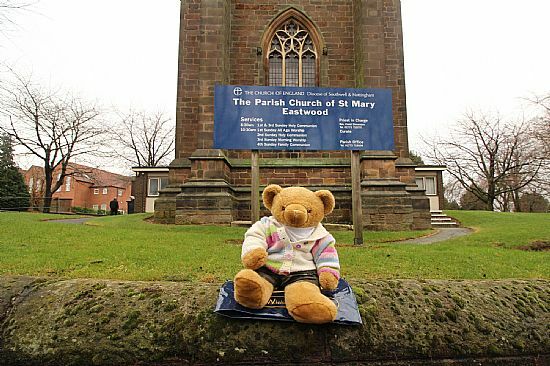 At this St Mary's I sat on the pointy bit of the notice board to have my photo taken then I went inside the church to look around. It is quite bright inside and has a drum on the wall. Apparently, it was used at the Battle of Waterloo (1815). 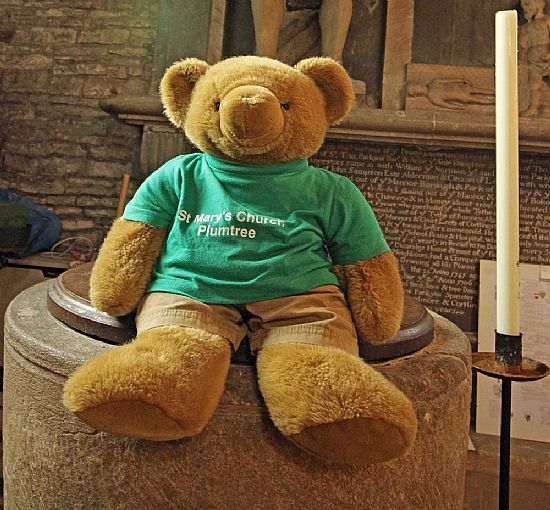 I also met another church bear! He was a bit odd as he only wore red boots; he didn't have smart t-shirts and trousers like me. 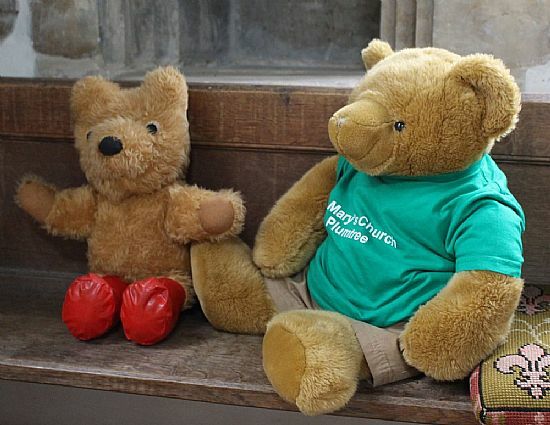 We had a long chat about our churches, the people that visit us and how naughty the children are sometimes (only joking, the children at MY St Mary's are very good, but I can't say the same of the adults... [snigger]!). 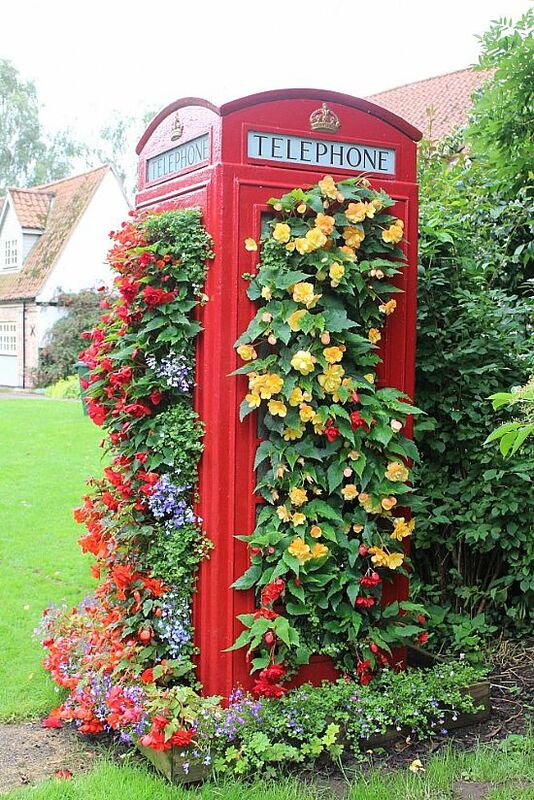 Outside Orston church there is a splendid telephone box with lots of flowers growing. It must be really tricky to make telephone calls in it! 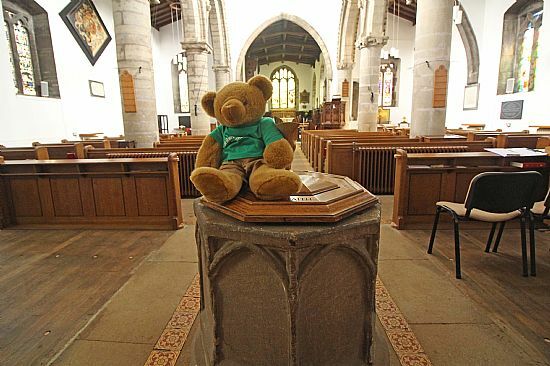 This St Mary's is only about six miles from my home in the Children's Corner in St Mary's Plumtree. 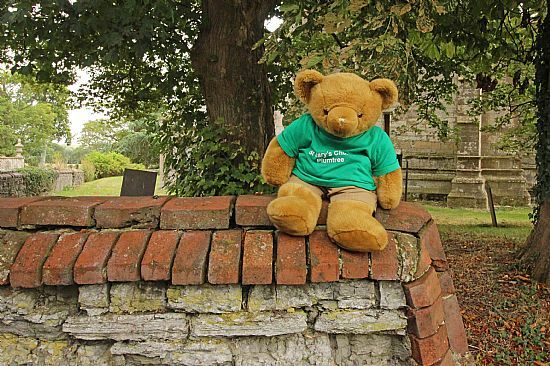 The church has got a funny top to the tower [It's called a "saddleback roof", Big Ted]. I sat on the wall to have my photo taken in front of the sign but it was a bit blowy and I did a somersault backwards off it! Luckily there wasn't a big drop behind the wall and there was a soft bit of grass so I was uninjured; but it's not the way to treat a "Roving ambassador" ('specially a photogenic one with splendid fur). 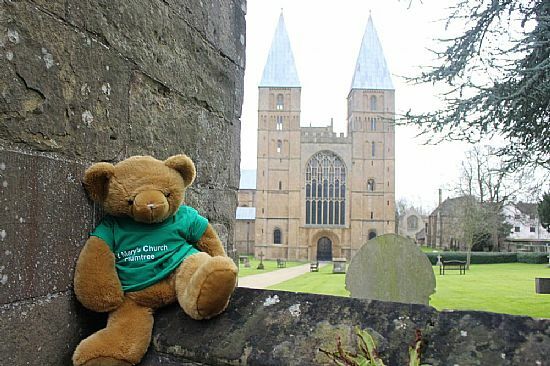 For my 20th "St Mary's" church I went to a very special place - Southwell Minster. Not only is this the Cathedral Church of my St Mary's, but it is also called St Mary's as well. As you can see, it's a really splendid building with two towers at the west end. 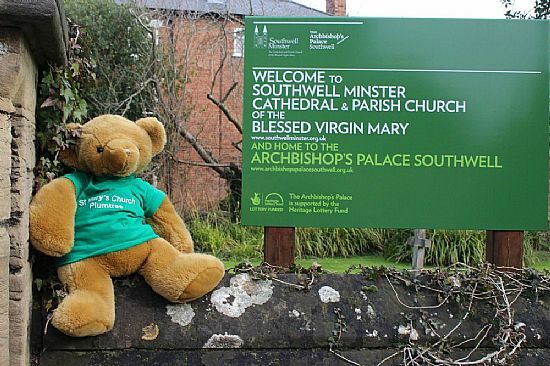 I used the photo of me with the minster behind as my main photo 'cos it's much more dramatic than the boring sign. It was a little bit rainy when I visited and I got ivy in my ear (one of the hazards of the job, along with prickly holly and falling off things). Go to their website, follow them on Twitter or find them on Facebook. 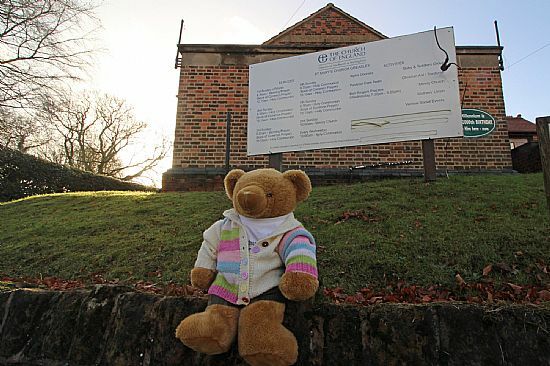 This is a nice little church, but it doesn't seem to have a notice board outside so Uncle Les took a photo of me sitting on a wall outside the church. I went inside as well and found the font - it's got a very comfy flat cover to sit on.